Normal cards changing tools are familiar to poker players. But do you know Iphone 6 cards exchanger? It’s one of the latest products for poker games that are used to change playing cards. Some people said marked cards for infrared contact lenses are old technology and there’s no secret about it now. Thus they don’t want to use marked cards any more. Then the changing cards phone that can change the clean playing cards is an ideal choice. You don’t need to worry about that others may detect your cards. Iphone 6 is the most popular mobile phone nowadays and it’s also a perfect cover for the cards changing device. Since it looks the same as other normal Iphone 6, you can just take this amazing device with a playing card inside and others won’t notice your secret easily. 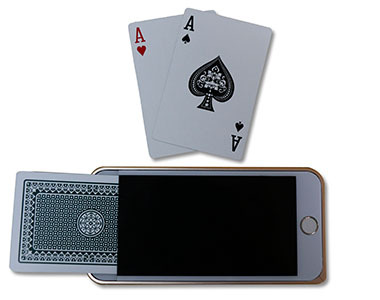 Just get this useful Iphone cards exchanger and enjoy your poker time.